To confront the political stance of kneeling during the national anthem directly, kneeling during the National Anthem is one of the clearest examples of free political speech that one can exercise, protected explicitly under the First Amendment. On Monday, Sept. 3. 2018, Nike released an advertisement photo showing that Colin Kaepernick would be the new face of the Nike Just Do It campaign. Colin Kaepernick is a former quarterback for the San Francisco 49rs team, who is best known for his bold action of kneeling during the National Anthem at football games. According to CBS New York, Kaepernick Re-negotiated his deal with Nike that was set to expire into a multi-year deal to make him one of the faces of Nike’s 30th anniversary Just Do It campaign. The action of kneeling itself was enough to spark controversy among Americans across the country. However, when Nike announced Colin Kaepernick as the new face of the campaign, it ignited a much larger social uproar towards the Nike corporation. Many Americans became upset with Kaepernick when he took the political stance of kneeling during what is considered one of the most patriotic symbols of respect towards America, but what specifically incited the tensions between many over the support of Nike, was that a large multi-million dollar brand/cooperation, with heavy media attention, took a heavily controversial political stance. Some would say that large corporations or celebrities with this level of high media impact should have no political voice or at least initiate a neutral point of view. This is so that they would not bias the opinion of the general public, or to ensure that the people, specifically younger generations, could “decide for themselves.” The American youth and people are not as naive and easily impressionable as some would make us out to be. With the prevalence of the internet, and the teaching of researching online information in schools, in this modern age, it is becoming increasingly easier for people to retrieve concrete unbiased information about what’s going on in the world or at least for people to understand whether or not what they are reading is biased. I would also like to vigilantly express that young people, myself included, are fully capable of forming rational and logical opinions based on copious amounts of research. To confront the political stance of kneeling during the national anthem directly, kneeling during the National Anthem is one of the clearest examples of free political speech that one can exercise, protected explicitly under the First Amendment. Many became upset with Kaepernick, and his supporters, for his actions saying that they are “against American ideals” and “is of utmost disrespect to our military members that are fighting for our freedoms” however, I find this oxymoronic in itself because, both the constitution and the military both defend and fight for these freedoms (including the freedom to kneel) to remain protected keeping the United States at a state of true freedom of expression and independence. Veteran David High said, “It doesn’t matter, you have the right to do it, people that are getting angry about it are being unjustly angry.” High continues discussing similar issues such as burning the flag which follows the same reasonings and principles as kneeling during the National Anthem and said, “I’ve folded flags in Arlington national cemetery, I bleed red, white, and blue, but, you can do it, I don’t necessarily like when people do it but, it doesn’t offend me.” In regards to the Kaepernick situation specifically High said, “I actually was a person who defended his right to do so quite a lot when he first started doing it.” High says that he only ever lost respect for Kaepernick when he heard that Kaepernick was not participating in the elections by voting. However, in regards to the topic of discussion, kneeling during the National Anthem, High respects his right to do so even as a veteran in the U.S. Army. Both issues, being the controversy of the action itself of kneeling during the National Anthem, and the action of Nike supporting said stance, both have received clearly polarized responses and views from the people. This is positive and is vital to societal representation to show the different beliefs and values of all social groups while emphasizing the right to exercise one’s freedom of speech and expression. It is also an intricate aspect to society in terms of entertaining and maintaining the intelligent, intellectual discussion of political discourse. In Aug. 2016, Colin Kaepernick first received attention for his protest. He was a second string quarterback on the San Francisco 49ers when he decided to kneel during the national anthem before each game. Kaepernick hoped to bring awareness to police brutality throughout the United States. However, the protests eventually died off. Fewer players joined in, especially after the league set new regulations. Additionally, the leader, Colin Kaepernick, was opted out of his contract extension with the large probability that he would be cut. While the pre-game protests have simmered down, the controversy rages on. Most recently, one of the largest corporations on Earth, Nike, released an advert featuring Kaepernick. 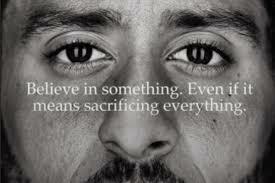 The photo of Kaepernick had subtitles: ¨Believe in something, Even if it means sacrificing everything.” While this phrase may have truth, it does not hold true in the context of Kaepernick’s situation. Kaepernick had good intentions but his protests did not go beyond kneeling when the national anthem would play; subsequently, the protest did not have the significance that he intended it to. Nike´s ad may have had some truth, but it was not appropriate in context of the situation. Nike made a mistake when it supported a protest that was not consistent. The first couple times that Kaepernick kneeled, it was during pre-season for the 2016 season. He had sat down for at least two games before it received any media attention. While his original explanation was vague, he later clarified that the group of people that are being treated unfairly are African Americans. While his protest may have been successful in bringing awareness, it failed to attack any specific legislation or lack thereof. In any great protest, the group aims to bring specific change. Kaepernick simply expressed his views which did nothing for the group he was vouching for. In addition, Kaepernick seemed to attack the American flag while meaning to attack an entirely different topic. Instead of attacking the deaths of defenseless African Americans, Kaepernick appeared to be attacking a tradition that embodied patriotism. This specific part of the protest led to Kaepernick having enemies with a valid argument. Officer Chris Judy, a resource officer with a military background commented ¨I don’t agree with him. It’s just not the time to show your stance. I have a military background.” Officer Judy feels insulted by his kneeling which could never be a result of an effective protest. Another man, Greg Bennett, with a military background feels the same way. “I am not going to watch the NFL until the players understand the lives that have been given to protect the American flag and what it stands for. For now, I am strictly a College Football Fan.” Bennett coaches soccer at Mcintosh, and he loves to compete. He hopes he can watch some of the best athletes in the world compete without feeling like he is betraying all the freedoms he has worked so hard to defend. Due to the NFL being a business, it has every right to control it’s employees behavior in the workplace. Because the Kneeling was affecting the game’s ratings and views, it was forced to begin fining players that chose to kneel during the national anthem. While the first amendment allows free speech, companies have the power to censor it’s employees during their time in the office. The NFL was forced to begin fining players because of the protest’s failure to have a clear and concise message. A protest can not be successful if it does not a specific goal that wants to be attained. While the NFL recognized these faults in the protest, Nike did not which led to a disastrous advertising campaign. Because Nike entered the realm of politics, it has permanently eliminated some of its customers. This is a sign of a poor marketing campaign. As Kaepernick has seemed to attack the flag in an attempt to address an entirely different subject, he has created enemies. Because Nike have an ad that features Kaepernick, they have lost potential customers. While Nike has potentially gained customers through this campaign, it is still having to make up for customers it has angered. Many try to point to Nike’s sales to praise the advertisement, people should point to the lost sales to prove the advertisement’s failure. An advertisement should never cause a company to lose customers, it should never have to make up for lost consumer’s. In Nike’s case, the advertisement may have created sales, but it has done so in the face of the stock dropping by 3.2% and a #BoycottNike hashtag trending. Politics and advertisements are both necessary in their own way, but combining them leads to poor results. Nike has proved this by supporting a protest that was poorly managed which has led to lost customers that they will have to make up for.